This is the first part of a series of three articles about how young Muslims can develop strength, courage and resilience in the face of peer pressure and bullying. In this part you will read about the impact of peer pressure and how you can stay firm. Ever had to deal with pressure like that before? Everywhere in this world people interact, and form groups and communities. Hence, wherever there are groups, small or big, there is pressure to conform to the accepted norm: whether it’s wearing skinny jeans, gossiping about your boss or teacher, asking for a mega dowry or being a silent witness to bullying or injustice. For a lot of our young brothers and sisters, standing up to peer pressure can be a relentless struggle in a period when you’re trying to establish yourself and your values. You can be pressured to conform by negative comments, ignoring, whispering behind your back, rolling eyes or giving you ‘the look’. But at the same time, peer pressure can often be very friendly, with encouraging remarks or well-meant advice to do something….. that you really don’t want to and shouldn’t do! It’s natural for people to want to be liked and accepted by the people that matter to them. Yet in the end, each one of us is individually responsible for the successes and failures in this life, and when your peers pressure you to do or accept something that’s not right and goes against your values, you should stay firm and stand up to the pressure. Well, that’s maybe easier said than done. You’re more likely to fall for peer pressure in new or unclear situations. Think about going to a new school, starting college or a job. In situations like this, when you’re out of your comfort zone, it’s likely that you rely more on others for information and clues on what’s accepted to do. These are times when you should take extra care to guard yourself against negative peer pressure. Peer pressure increases when being different has important consequences. What if your decision not to participate in an activity would mean that you will be ridiculed forever? Or if your speaking up about something will cost you your friends? Remember that you should do what’s right, even when the stakes are high. The Qur’an offers beautiful advice and guidance that you can apply when you are faced with negative influence from the people around you, and by the same token, you are also warned about the ‘follow the herd mentality’. It’s clear and simple. If you want to stay steadfast upon your deen (religion), live up to your values and be successful in this life and the hereafter: you should stay away from those people and situations that invite you to all the wrong things.You will probably know who and what they are when you come to think about it. At the same time, you aren’t meant to be a hermit, living only for yourself. Islam recognizes the importance of the bonds between the members of the Ummah. And as much as you can experience negative pressure, when you hang out with the right crew, you can encourage and motivate each other to achieve your best. Peer pressure the positive way! And remember the story of the people of the cave. They were young men who turned away from their corrupt society, and at the same time, stuck together for support. Tip #1: when you’re facing peer pressure, try to find someone older and more experienced in life to talk to about your problems, a mentor of some sorts. Someone who is willing to provide a listening ear and can advise and help you to stay strong and make the right decisions. A member of the Islamic community where you live, for example, or an older family friend – in any case, someone who you trust and who understands you. Tip #2: while it may be a bit impractical to retreat yourself in a cave if the situation becomes dire, you could try to create your own sanctuary. A spot just for you where you can retreat from the pressure and find yourself again. How can you increase your confidence, courage and steadfastness when dealing with peer pressure? Check your motivation: Ask yourself what really motivates you to want to do something, or leave something. If you want to be confident and steadfast in your actions, this is where it starts. Why do you want to wear hijab or avoid listening to gangsta rap? If you feel you lack genuine motivation, read up about the issue or talk about it until you feel more confident in your stance about it. It will strengthen your decisions in times when your values are put to the test. Be clear, don’t JADE (Justify, Argue, Defend, Explain): There are situations in which you can get into a discussion about your values, but when you’re dealing with peer pressure, be short and sweet about what you want and don’t want. For example, when you’re pressured to eat or drink something that you don’t want, you could just say: “No thanks, I decide what goes into my body”. Or, when friends push you to stop reading and go partying with them instead: “It’s up to me how I spend my free time”. JADE-ing will give people a foot in the door when you really need to have that door closed. Have something ready to say: Avoid being swept away by the insecurity of the moment, not knowing what to say or how to react. Write down some useful phrases and practice them too. You’ll probably have to find out along the way which phrases work best in which situation, but make sure you have some ready to use. Lead an active and productive life: Being busy with work, study, volunteering, being active in the community and seeking knowledge will boost your confidence and steadfastness. Stay busy, and as you start to see results and achieve your goals, this will make you confident and courageous enough to continue on the path you carved out for yourself, no matter what others will say. 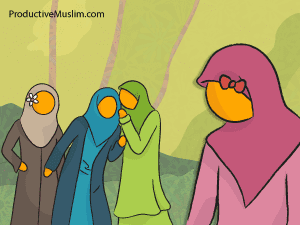 In the next part of the series, we will take a closer look at bullying, and how we as Muslims can deal with it.